At SunPower we are so confident in the efficiency and reliability of our industry leading SunPower Equinox™ solar solution that we back it up with the best warranty so you can rest easy knowing that your investment is fully protected. While there is a natural loss of energy production at a certain rate per year for all solar panels – like humans, solar cells get a little sunburn -- SunPower’s highly efficient, highly durable panels degrade at a much slower rate than conventional panels, so we’re comfortable backing up our energy production with the best power warranty in the industry, which assures that your system will produce 92 percent of its rated power in year 25. In partnership with the National Renewable Energy Laboratory (NREL), the U.S. Department of Energy's primary national laboratory for renewable energy and energy efficiency research and development, we developed a robust method to calculate solar panel degradation. When this method was applied to eight years of energy performance data from 264 SunPower solar systems operating at various locations worldwide, it showed that SunPower panels degraded less than 0.25 percent per year – 50 percent less than the annual degradation rate for conventional panels. This is why we are confident to provide our industry-leading power production warranty. 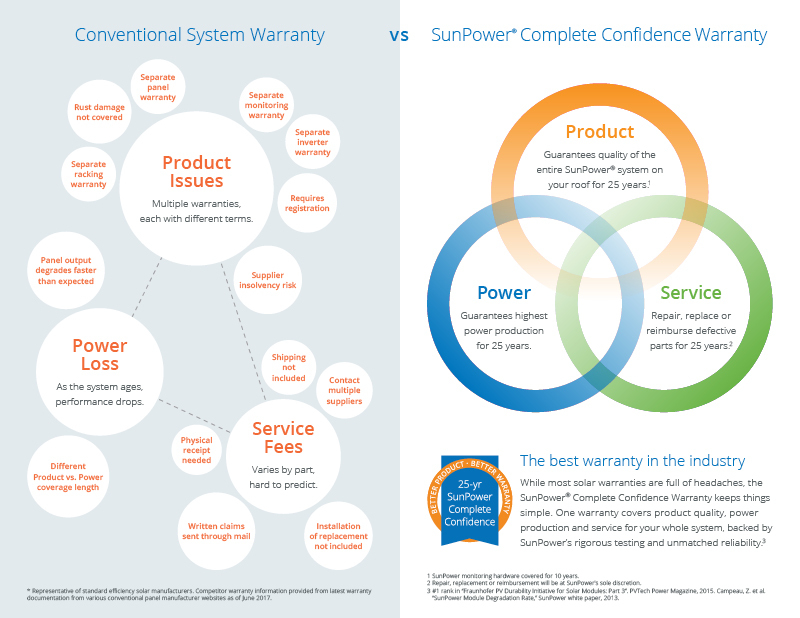 SunPower covers the entire system with one warranty for the full 25-years,2 regardless of whether the issue is a product or power one. Let’s say something goes wrong with the Fisher family’s home solar system many years after installation. They don’t understand what the issue is, and they don’t know who to call. OTHER SOLAR COMPANIES: The Fishers call the panel manufacturer, but after many conversations and even a home visit by a local technician, they’re told that the defect is not in a panel but in the inverter, an important piece of equipment that helps convert DC power from the panels into AC power for the house. The Fishers have to then call the inverter manufacturer, which may require them to pay for a certified inverter technician to come diagnose the problem. SUNPOWER: The Fishers call SunPower, and SunPower has a SunPower-certified installation contractor fix the issue. It doesn’t cost the Fishers anything, and the service call and repair are completely covered under their comprehensive SunPower Complete Confidence Warranty. In another hypothetical case, Joe Vasquez has a problem with his home solar system not long after it was installed. It quickly becomes clear that there is a defective panel on his roof. OTHER SOLAR COMPANIES: Mr. Vasquez realizes, after calling customer service, that he has to pay out-of-pocket for a technician to remove the defective panel from his roof, and he also has to pay to ship the panel somewhere overseas. After following up with customer service several times over the next few weeks, he is told that his warranty covers a new panel, but he has to pay to have it sent to him, and he has to pay for a technician to install it on his roof. SUNPOWER: Mr. Vasquez calls SunPower, and SunPower sends a SunPower-certified installation contractor to repair the issue. The contractor removes the defective panel and replaces it with a new one. It doesn’t cost him anything. The takeaway is that SunPower offers the most comprehensive warranty in the solar industry because we stand by our design and workmanship. Our warranty will provide repair, replacement or reimbursement.3 We have absolute confidence in our product’s long lifespan because SunPower solar panels have an estimated useful life of 40 years4. That means you can have complete confidence in knowing that your investment is fully protected for years to come. SunPower also offers a best-in-industry solar panel warranty for our commercial and power plant customers. Visit our website to learn more. Thinking about buying a home solar system? Visit our solar savings calculator to see how much you might save. 1 The SunPower Complete Confidence home solar warranty covers the SunPower Equinox solar system with E- or X-Series solar panels. 2 Monitoring hardware covered for 10 years. 3 Repair, replacement or reimbursement will be at SunPower's sole discretion. 4 "SunPower Module 40 Year Useful Life" SunPower white paper. Feb 2013. Useful life is 99 out of 100 panels operating at more than 70% of rated power.